The Hawker Hunter has always been a beautifull plane and although numerous kits appeared in 1/72 scale, no real kit was available in 1/32 scale for many years. In the nineteen-eigthies ECHELON from the UK came with an excellent kit but is was a vacuform. This vacuform enables you to built all marks of the Hunter and a separate vacuform enabled you even to build the two-seater. Fortunately, Revell of Germany came with an injection kit (no. 04703)in 1/32 scale in 1998 representing the FGA9/mk 58 variant. It still was not possible to make a popular mk.4 or F mk.6 without some rework. 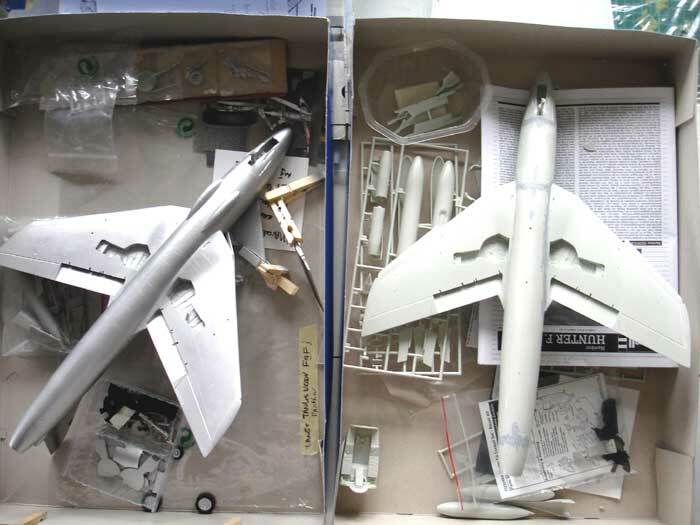 In 2006 Revell issued a Hunter F.mk6 kit (No.04727 ) by adding some extra parts to the original Hunter kit and new decals. This modelling report will cover all 3 kits and will focus on the Hawker F. mk6 and Hawker F mk.4 as used in the Royal Netherlands Air Force. It will not cover extensive Hunter history as there are numerous sites on the internet and books on this subject. Please see the references below. Lets look a little to the Hunter history. The Hawker Hunter was developed in the early nineteen-fifties with the first production version F mk.1 being build May 1953. After testing and further improvements, the RAF set the F1 into operational service in mid 1954. 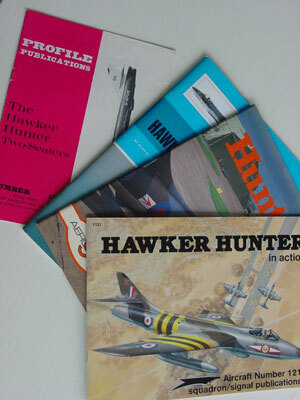 Hawker continued work on the Hunter, coming up with the mk.4 that was put into RAF service beginning 1955. The mk.4 had an Avon series 100 engine. The later much improved variant was the mk.6 that came of the production line end 1955. The mk.6 got wing leading edge extensions with the sawtooth on the outboard wing section. Note: the wing sawtooth was also often retro-fitted on earlier mk.4 planes that were still in operational use. This was also the case for mk.4 used by the RNeth AF. The mk6 also got a more powerfull Avon series 200 engine with a large exhaust pipe diameter . Internally the systems and avionics were also improved. The mk.6 was also capable of firing the first early Sidewinder missiles. The improvements made during service life and the various variants often also involved better ejection seats of Martin Baker. Hunter have flown with several seat versions, the earlier types with the 3H seat and later types with the 2H seat. But often these Hunters were retro-fitted with the 3H, so check the particular Hunter you want to model. One of the final Hunter versions was the FGA9 developed from the mk.6. It got the most powerfull Avon engine and a parachute pack on top of the exhaust pipe. The wing got reinforcements and was capable of carrying the larger 230 gallon fueltanks. Also new systems and avionics were fitted. Depending on the particular air force needs, systems were added particularly for the Swiss AF Hunter mk.58 type delivered in the early sixties. 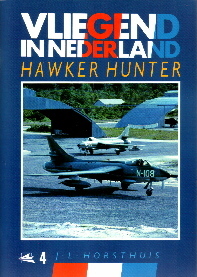 The Dutch air force, or RNeth AF, obtained Hunters through the MDAP program. 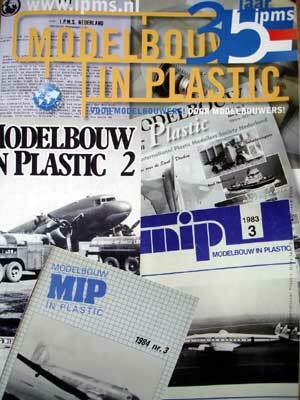 (Hunters were also produced in license by Fokker in The Netherlands and SABCA in Belgium under this program). The first mk.4 was delivered to the RNeth AF beginning 1956 with 96 mk.4 delivered. Also the mk.6 was ordered with deliveries starting 1958 with 93 F mk.6 planes delivered. Many mk.4 planes were retro-fitted with the later F mk.6 wing sawtooth modification to improve safety and stability. In addition, 20 T.mk.7 two seaters were delivered to the RNeth AF directly from the UK. Hunters were used in various squadrons by the RNeth AF not only in NATO use but also in Papua New Guinea in 1960-1962. 6. 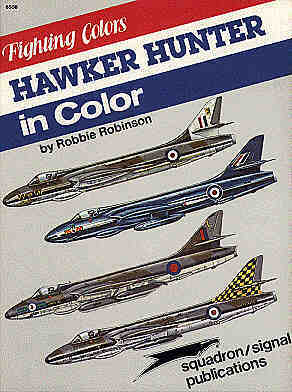 Hawker Hunter - Biography of a Thoroughbred, Francis Mason, 1985, Patrick Stephens Ltd.
7. 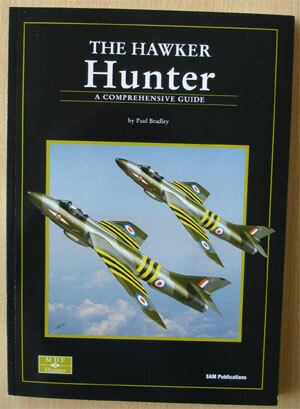 Hunter, several others like..... Aeroguide 9, 1985, Linewrights Ltd.
On the internet: use Google to search! plenty of stuff!